The Dubai World Cup takes place at the Meydan Racecourse in the United Arab Emirates (UAE) and is a heady combination of money and top quality racing which captures the attention of those passionate about international racing. This event is known to draw in racing talent from around the world, making for a truly unmissable event. The Dubai World Cup started in 1996 though thoroughbred racing has taken place on the course since 1981. At the time Sheikh Mohammed bin Rashid Al Maktoum was the vice president and prime minister of the U.A.E and had organised three thoroughbred races that included a camel track for a sprint, a mile contest and a one and a half mile race. The Dubai Racing club was formed in 1992 after which the Dubai International Jockeys challenge was held – in which riders from the like of Europe, Australia, Japan, United States, and of course the U.A.E participated. The first Dubai World Cup in 1996 was run over a 2000meter dirt track with a purse of $4 million . American horse of the year Cigar, who had won 13 consecutive races, was flown over to take part, and won the event putting it on the map in the process. The Dubai World Cup was one of the richest race last year, surpassed only by the newly constituted Pegasus world cup in the United States. 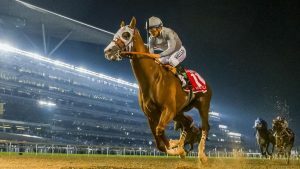 The world cup card is likely to remain one of big money race days in the world history, this year with 30 million dollars in purses across nine group of races. Other events include two group 1 grass races, Dubai Sheema Classic, and the Dubai Turf which are worth 6 million dollars. The Dubai World Cup this year consisted of ten potential competitors of which half of them were based in the United States. The charge has been led by two champions in the event who are the colt West coast and the mare Forever Unbridled. There are other notable names like the Talismanic who has been trained in France to compete in the World Cup. Trainer Saeed bin Suroor is noted for his success in the race, with 8 wins to date. No horse has won the event more than once.